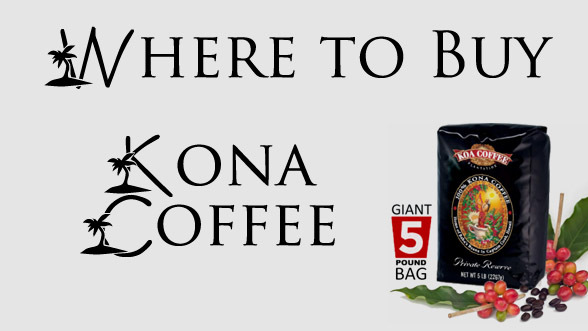 When I give samples of kona coffee to my friends, one of the first things they ask me is: “where can I get more of this stuff?” While you can purchase kona coffee pretty easily through mega-merchants like Amazon, there’s a couple simple tips to make sure you get the freshest coffee possible when you’re ordering it online. For one, ordering from the farms is the easiest way to make sure you get fresh coffee, although it’s not a guarantee. Koa farms (featured below) states that they will only roast your coffee after you order it. If you want to order from Amazon.com (to take advantage of shipping perks), make sure the coffee you order says ‘farm direct’. Blue Horse, for example, takes orders through Amazon but ships the coffee directly to you (so your coffee isn’t sitting in a warehouse somewhere). When shopping for kona coffee, make sure the package says 100% kona coffee. If a coffee says ‘kona blend’, it usually means it has less than 10% actual kona beans, with the other 90% made up of inferior-quality beans. Safeway recently settled a lawsuit involving ‘kona blend’, but there currently is no legal protections for coffee farmers at the moment. Until that happens, one thing we can do to ensure that our favorite coffee keeps thriving is to make sure we only buy coffee clearly labeled 100% Kona. These resources are places with proven track records where you can make sure you will get high quality, freshly-roasted coffee (or unroasted green beans if that’s your preference). Koa coffee plantation is one of the largest farms in the Kona Coffee region and they have an excellent reputation for freshness. 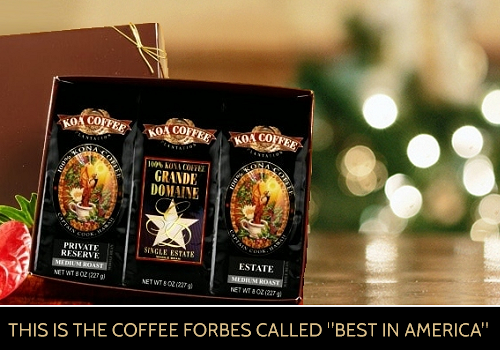 We’ve already declared their Kona Estate Medium Roast to be the ‘best kona coffee’. Their coffee is made up of the three highest grades of kona coffee: extra-fancy, fancy and peaberry. In response to the crop shortage this year, Koa has been purchasing high-grade coffee from smaller farms this year in order to meet demand. This means that Koa is a no-brained to be in stock even through this year of kona coffee scarcity. The coffee you order is roasted the day of (if you order early in the day) and sent out early the next day. Which means that if you order your coffee on a Monday, it will likely be at your door Thursday afternoon. A lot of people have strong feelings about how Starbucks roasts their coffee. 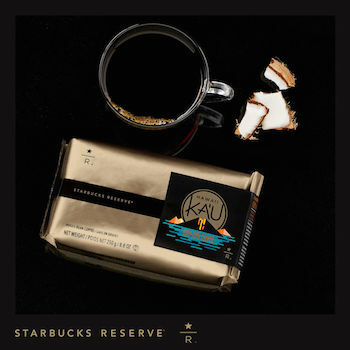 But this Ka’u coffee is part of their ‘Starbucks Reserve’ collection, which uses different roasting methods based on the type of coffee and the flavors they are trying to bring out. For the Ka’u coffee, they have created a truly sweet, delicious coffee. The coconut and caramelly notes will instantly transport you back to the Hawaiian islands. Pair this with any coconut or nutty-flavored pastry for a truly delicious experience. Blue Horse thankfully makes their coffee available on Amazon.com, so you can take advantage of their numerous shipping options. The coffee you order is farm-direct however, so you can make sure that you’re still getting the freshest coffee possible. Blue Horse’s dark roast is a milk-chocolately flavored coffee that is almost as smooth as Koa coffee’s Estate roast. Blue Horse also offers lots of options for their coffee: you can order it unroasted, in bulk, peaberry, etc. Pretty much any way you like it! There you have it! Be sure to check out our Kona Coffee Shop, where you can choose from hundreds of 100% Kona coffees. You can shop for a particular type of coffee (i.e. peaberry kona), by grade of coffee (i.e. Extra-Fancy, Fancy) and you can even search by Hawaiian Island. Due to a shortage in teh supply of kona coffee this year, larger coffee farms have been purchasing coffee from smaller farms. This means that a lot of the smaller farms have already sold out of their coffee this year, whereas larger farms will be more likely to still be in stock. The Greenwell family history almost goes as far back as the history of kona coffee itself. Nowadays Greenwell Farms makes a few outstanding premium coffees. What they are most known for, however, is their coffee farm tours. If you’re ever in Kona I highly recommend going on a tour of their farm. You’ll learn everything you ever wanted to know about how to grow coffee. Plus you’ll get to taste some freshly roasted coffee yourself. Mmmm…I think I need to go back! Click here to visit Greenwell Farms’ website.